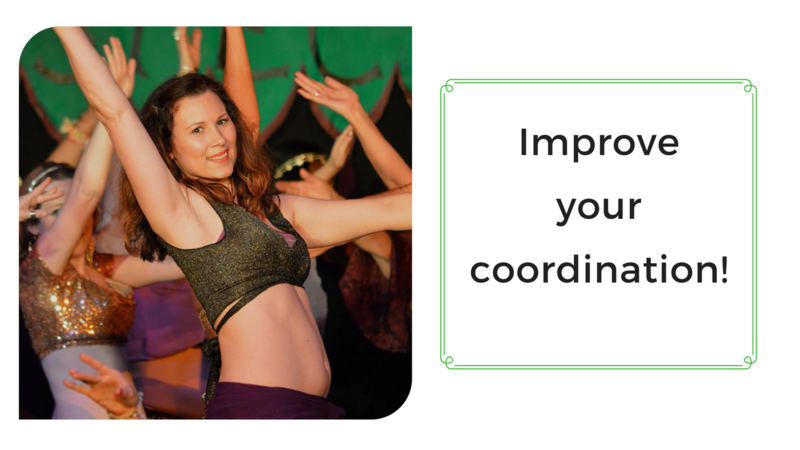 Do you struggle to coordinate your hands, feet and arms when you dance? Don’t worry, it’s completely normal! But it doesn’t have to be that way. With a bit of practice you can smash through that awkward feeling and enjoy artful, controlled and confident movement. If you like to have a bit of guidance and “hand-holding” during your practice, then you’ll love today’s tutorial. I’ve compiled a short belly dance coordination drill to help you practice harmonizing different movements simultaneously. The idea is to do it on a regular basis so you can make small, incremental, solid improvements to your coordination skills. I’ll talk you through as we go, giving you prompts and pointers to think about. We’ll be using a basic camel action and layering on some arm patterns and positions. You’ll be gently challenged to combine different movements whilst maintaining a calm and cool composure. And the best thing about this drill? The more you do it the better you get! If you thought that your coordination skills were a lost cause, think again. I KNOW you can do this! All it takes is a little commitment from you to squeeze in just a couple of minutes of practice on a regular basis. I hope you enjoyed the drill, I’d love to know what you think! Be sure to leave me a comment on youtube and give a thumbs up (so I know you dig this kind of thing). Thank you so much. Are you ready to dip your toe in the glittery belly dance waters? Why not try a one off taster session with us! Our next batch of taster sessions are now open for bookings – woo hoo! It’s like Christmas – we only open these up once a year. Head over to our Beginner page and book your place now! If you’re further along on your belly dance journey I’m happy to say that our complete Summer timetable is open for bookings! We have courses to suit all levels of dancer, so there’s something for everyone. I’m incredibly proud of our SMBA coaching team who stretch their creativity each term to bring our students new and exciting routines. Our Summer term is no different! You can expect to be expertly guided through the moves and polished to performance standard throughout the 12 week course. Go here to book your place now! I’m super proud to say that after watching my interview with Charlotte Desorgher about the Bellydance for Joy project, my Desert Pearls have organized an amazing Hafla. They’ve even invited me to perform! Check out the facebook event for more info. So what part of your dance would you like to work on today? Whenever I ask my students this question I can bet my bottom dollar that arms will be a popular topic. I’ve even come to notice that my arm tutorials are among some of the most popular! So in today’s blog post I thought we could work on arms. The only thing is, there are gazillions of (really good) tutorials on arm technique out there in youtube-land. So, rather than add to those, I’m going to change the focus and get you to start working on achieving perfectly timed and placed arm positions. Why is this important? Because it’s how we can begin to figure out that ethereal thing called musicality. We often think the key to achieving graceful supple arms is just about drilling technique. To a great extent it is, but I believe that dancers with seamlessly integrated rhythmical interpretation in their belly dance armwork are the ones that really stand out. And I want you to stand out too! So today’s express class features a short drill to get you thinking about musicality with a focus on rhythm and timing, not just technique. I’ve been using this in class and seen some great results with my students. Would you like to start your belly dance journey with me? Now you don’t have to live local to the mothership here in Reading, UK! Go to santamariabellydanceonline.com to join my online belly dance studio where you’ll find all sorts of video classes and tutorials. One last thing before I go. If you’re starting or thinking of starting to teach bellydance, you might like to check out a series I was interviewed for recently about Growing Your Teaching. It’s by Nara Nemer and she asked me specifically about how to sustain your teaching, go here to check it out.